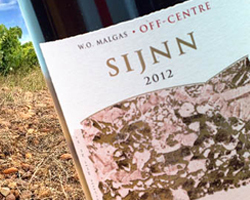 Great wines come from marginal terroirs and rugged sites and the unique stony and poor soils of Malgas offer just such a milieu. 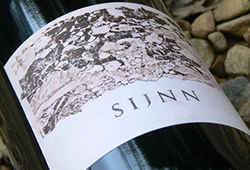 It is here that David Trafford and his team are producing the Sijnn wines from a plateau of slate and rolled stones that are reminiscent of the ‘galets’ found in Châteauneuf-du-Pape. The recent vintages have rightly received excellent ratings from Wine Spectator and offer exciting drinking. 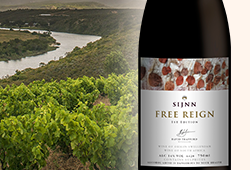 True to their pioneering spirit, Sijnn is South Africa’s only producer of Trincadeira (Tinta Amarela) – a Portuguese variety that is described as something of a heartbreak grape like Pinot Noir. With the aptly-named Off-Centre 2012, David has bottled a unique blend of Trincadeira and Mourvèdre. Fresh acidity mingles with crunchy red fruit and a powdery, spicy earthiness. Beautiful with food but wonderfully intriguing on its own, Off-Centre is an ethereal yet powerful wine with only 12.5% alcohol. This is an extremely limited offer (6 bottles per order) on a wine that captures the quirky spirit and soul of this special site. Free delivery on orders over R1,500 (main centres only). If you need any assistance, call us on 021 448 4105 (CT) or 011 027 9463 (JHB). View delivery charges. 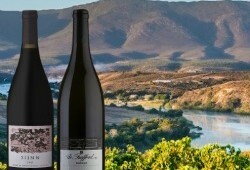 Order online, or email James@winecellar.co.za.